January 17, 2019 – Today at the Lamacchia Realty 2019 kickoff event in Needham Anthony Lamacchia announced that for the second consecutive year Darlene Umina was the Realtor with the most sales volume company-wide in 2018. 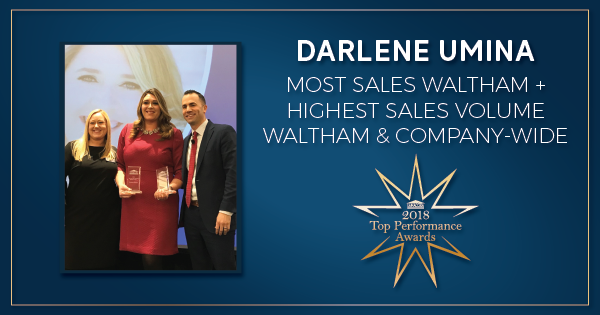 In addition to the most sales volume company-wide she also won the most sales and the highest sales volume in the company’s largest office in Waltham. In 2018, Darlene had a whopping 46 sales and $25,915,000 in sales volume! Darlene Umina has been a REALTOR® since 2007 and after a handful of years doing it part-time when her children were very young, she joined Lamacchia Realty in 2014. Darlene serves a wide span from Waltham out into the Metro-west area where she lives and grew up. Darlene is a repeat member of the Lamacchia President’s Club in both 2017 and 2018 Lamacchia Realty President’s Club. Click here to watch her Bio Video and to learn more about Darlene, click here to visit her website Darlene Umina. “What an honor to finish the year as #1 Sales Volume for the second year in a row!! I am forever grateful to my clients who continue to trust me with their real estate goals, friends and family who believe in me and refer my services, my family circle for being the light I need each day, my team for knocking it out of the park, and of course to my biggest cheerleader- my brokerage! Without all of your support this would be impossible. I look forward to another year of helping the community & forging deeper relationships with past, present and future clients as they take the steps to truly Love Where They Live,” said Darlene Umina Realtor. Darlene is known for her incredibly creative marketing ability and it shows on her website and her very active Facebook page. Lamacchia Realty Waltham was number one in Sales Volume of any Independent brokerage in 2018.